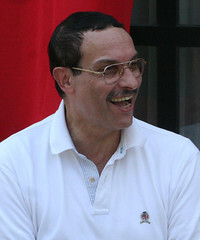 Mike “Loose Lips” Debonis of the City Paper has a big scoop this morning: Mayor Fenty will have a real challenger in Council Chairman Vincent Gray, starting tomorrow, when Gray files to be a candidate for the September Mayoral Primary. The big question is: can Gray raise enough money fast enough to offset the over $2M already in the Fenty war-chest, and can he run a campaign based on the Mayor’s executive behavior in his first term and be successful? Gray was listed as competitive with the Mayor in a recent poll this winter listing potential challengers. Another question remains: will At-Large councilman Kwame Brown throw his hat in the ring, either for Gray’s old job as Council Chair, or to try a three-way battle for Mayor. We shall soon see.